The BF bought a new (old) car on Friday. We paid $2,800 in cash for it. It's worth more than what he bought it for and as he was looking for Jeeps, he found that the same year and mileage usually went for around $5,000. However, lots of maintenance was needed and the Jeep belonged to his friend, so he got a good deal. Him and his dad are going to do all of the maintenance for less then $100, so it's a pretty good deal. We didn't want payments on a new car. So we opted for cash instead. He also sold his old car just a couple of hours later. We kind of regret selling it though because it still had a lot of life in it, but oh well. It's gone and it would've just sat in our driveway, and we also don't need to have 4 cars for just the 2 of us. He bought a white Jeep Wrangler that's in good condition. He's been doing maintenance this weekend and will continue doing the rest of the car maintenance next weekend. The one thing I hate about the Jeep is that it gets HORRIBLE gas mileage. His last car got an average of 29 mpg, whereas the Jeep only gets 17 or 18. Luckily the BF's job is only around 5 miles away, so the increase in our gas budget won't be that much. He's happy too, so I'm not upset either. He is so in love with his Jeep that it makes me laugh. We sold his old car for the EXACT same price that we bought it for 2.5 years ago. So that's quite a deal. We also didn't have any repair costs for the car for the whole 2 years, so it's like we had the car for free. So now I felt like he deserved something better, and he's also been pretty happy all weekend. His insurance went up slightly, but not too much. His insurance is now around $76 a month instead of around $34, but that's only because we added a $500 deductible for it. We're only going to keep this deductible on it until he gets used to driving a stick shift, since this is something pretty new to him. But after that, his insurance will drop back down to around $40 because he will just have liability on the Jeep. Yes I would have loved to buy a car that got better gas mileage and one that I could drive as well (stick shifts scare the heck out of me), but he loves it and it was super cheap. So altogether I'm guessing this car will add a little less than $100 to our monthly budget. But in a couple of months it'll just be around $60 to $70 extra each month. Which I don't think is too bad considering that we don't have a car payment for it. What do you think? It was probably not a great idea to buy a gas guzzler, but oh well. What car problems have you had lately? 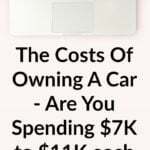 Any car costs added to your budget lately? A couple of other questions. Does gas mileage play a big factor into what car you end up buying? What factors trump others: gas mileage, the miles on the car, value, luxury, 4 door or 2 door, etc? Oh, wow. I would love to see a car that decent within that price. Since my car dying in October, I've been borrowing a car I really do NOT like. Takes me from A to B, but I just dont like how it handles, and it's not going to last very long. Factors when buying a new car? Mileage is a big one, since I'd love to travel, and gas is ridiculously expensive. I can't travel with my current car, as I am sure I would be lucky if it takes me out of state, let alone across states. Miles on the car plays a part on both price and duration. Only reason I'd get a 100k+ mile car is to get me through, say, a year or two of light-weight usage. I have a preferrence for 4d cars. But definitely miles/mileage are my top two concerns, in that order. In December my beloved Ford 500's transmission went out. I had paid cash for it 3 years ago, and I was so proud that I had paid for it without my parents' help. I didn't have enough money to have a decent car payment, so my only option was leasing. I leased a brand new Ford Focus for only $105 a month with taxes. Probably the best decision I've made for myself in quite a few years. $2800 for a jeep is great. They are so expensive usually even REALLY used ones. We like to pay cash for cars as well. I have had my car for 4 years now and I am still so in love with it. I used to have a Mustang and I hated it. I have a Nissan Murano now that I plan on keeping until I can afford to pay cash for a Porsche Cayenne (aka a long time). I guess I like bigger cars and as long as it gets about 20 mpg I'm happy. I've always ever had brand new cars and my husband has always had newer used cars. I see the pros/cons both ways and b/c I LOVE not having a car payment when it comes time for me to get a new car, I will prob get a newer used car as well now…it sounds like your bf got a really good deal! Fairly recently I had to replace the transmission in my Buick Rendezvous and that was a huge hit that I hadn't planned for. I am pining away for a new Camaro in a couple of years, but honestly, with gas prices I'll likely opt for something more fuel efficient. Hubby gets a GM discount, so will also likely be a new car when it's time to purchase simply because the discount puts us less than what a used car would cost. For us, the price of gas plays a factor… My son and his wife are living with us currently and we have to pay for his gas on occasion. Paying for 4 cars worth of gas is quite a drain.The jeep looks great and it's great that he loves it! When I bought my vehicle in 2009 I was ready to move out of the minivase phase of my life. I needed something that still had room for 2 kids and had enough room to put hockey equip/camping equip in the back. It had to be reliable for Sask winters and lots of road trips in questionable weather. The gas mileage was important too, but the right size and room was moreso. I always wanted a Wrangler. But MPG under 20 is a deal breaker for me. I even felt this way years ago when gas was $1.50, let alone the soon-to-be $4 prices coming. But great point that with a 5 mile commute the actual monthly price increase isn't that big. I'm sure your boyfriend is very happy with his new Jeep. It sounds like he got a really good deal on it, especially if he doesn't have to pay a mechanic for the maintenance. You just have to get used to convincing him to take your car out when you go out somewhere together. My ex was always convincing me to drive her little Toyota Yaris instead of my gas guzzling Mustang. My old mechanic had a saying when it came to us taking care of our our aging cars and it was "that car don't owe you nothin'!" That's what I thought of when you wrote that you sold the old one for the same price you bought it for. It's good to get your money's worth out of your ride! we just bought an SUV b/c we added baby to the family! it was hard b/c both of our cars were paid off but it's definitely worth it! and gas mileage played a huge role in what we chose. My first car was a sedan and had oddly poor gas mileage. Then I got a jeep liberty and for some reason the gas mileage was the same as the sedan-bad. I only drove about 8 miles to work and back at the time and some weekends I'd visit family about 30 minutes away. I just felt like I barely drove and was still at the pump. So it's very important to me especially with gas prices going through the roof. But you got an awesome deal. I am done with the minivan, hated it since the day my husband bought it. I am so happy with our new to us, used suv. It is a 2011 that was used by an older couple that never used the back 2 rows of seats. Perfect condition, low milage and lots of bells and whistles. I wanted something that had AWD and 4WD option to travel thru canadian winters. We are getting a bit lower gas milage but not that much and insurance only went up 7 bucks a month! I am so in love with the heated seats 🙂 So now I have a hot rear end and a kick but stereo! (Just like when I was in my 20's!! ha ha ha! )For zipping around town when it isn't the family of 5 we take my '96 Accord. It is a stick shift, loaded (except for leather) and gets great milage! Nice deal on a car! We used to own a black Jeep Wrangler but my Hubby's commute is about 30 min. one way every day, so Jeep was just too much of a gas guzzler for us. Our love our little Corolla now but we definitely need something bigger for our family! I have had my Jeep for ten years and love it. If there was nothing wrong with his old car and it got better gas mileage why did he get rid of and get the Jeep. I'm just wondering if I read something wrong or if he just felt like a newer vehicle. I have a F150 pickup that gets around 18 mpg in the city. I am looking into getting a second car to commute that gets better gas mileage. Love the truck for road trips and camping and hiking in the summer! I like the idea of trying to pay cash for a car, if possible. So affordability matters. Then, it's reliability, potential longevity, and safety for kids that factor into decisions.As for car problems, I will need brake work done sometime soon. Otherwise, nothing else – as far as I can tell anyway! Hi! I'm a new follower of your blog but I just wanted to say I'm so happy I found it! I follow so many "fashion" and "beauty" blogs but I'm definitely a money conscious girl and your blog is very refreshing! 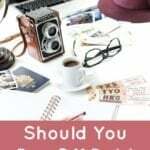 I blog too but I'm still trying to find my "niche" lol Currently, I write about anything that comes to mind… fashion, makeup, saving money, my life in general. lol I look forward to reading more of your blog! Good deal! Paying cash is always best. Wish I learned this sooner, since I still have a car payment on my vehicle. My husband just bought a new (to us) car a month ago. Gas mileage is important since we have 40 mile commutes one way to work. This car gets about 25mpg, better than his truck, around 16mpg. That helps with the budget! We have the worst luck with cars, so I'm really hoping it lasts awhile. Thanks everyone! Buying a car with cash has definitely been nice. My car is paid off but probably not going to be worth the next big repair bill. I'm kind of freaked out about that. I want to pay cash for my next car though. That's great that you guys could do that. You're smart! You seem to have gotten a pretty awesome deal all around, especially selling the old car for the same price you bought it for 2 years ago and with no repairs that is even better. That's almost like a profit you made minus the gas you had to put in it.I've actually got a car expense tomorrow. Maintenance related. Sigh.When it comes to buying a car, the most important factor to me is that is has been properly maintained. Especially engine wise.